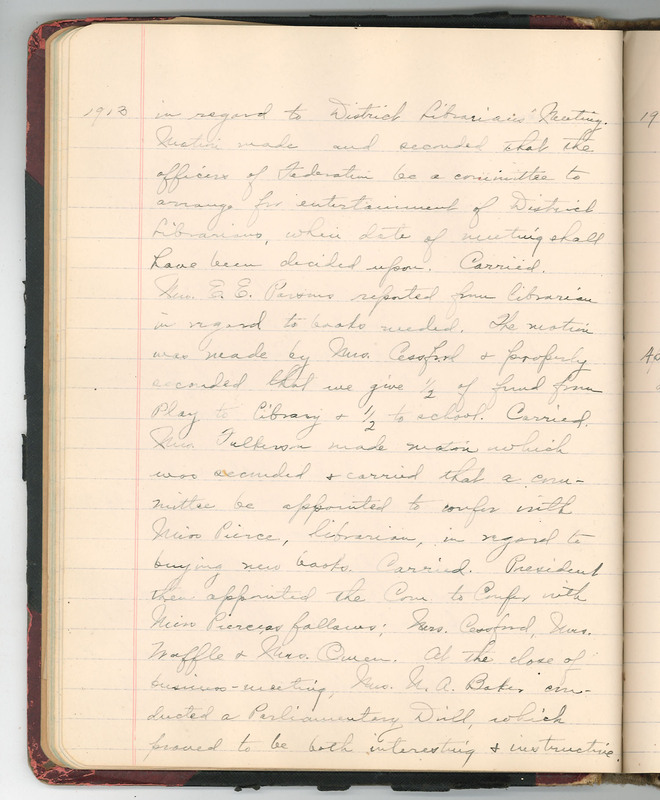 1913 in regard to District Libraries' Meeting. Motion made and seconded that the officers of Federation be a committee to arrange for entertainment of District Librarians, when date of meeting shall have been decided upon. Carried. Mrs. E. E. Parsons reported from librarian in regard to books needed. The motion was made by Mrs. Cessford & properly seconded that we give 1/2 of fund from Play to library & 1/2 to school. Carried. Mrs. Fulkerson made motion which was seconded & carried that a committee be appointed to confer with Miss Pierce, librarian, in regard to buying new books. Carried. President then appointed the Com. to confer with Miss Pierces, as follows: Mrs. Cessford, Mrs. Waffle & Mrs Owen. At the close of the business-meeting, Mrs. N. A. Baker conducted a Parliamentary Drill, which proved to be both interesting & instructive.